202 in stock Need More ? Is it wrong to love whatever is beautiful and rich? I love it precisely because it is beautiful, because it is rich - because, I think, it brings joy to my heart. . . On Christmas day, in the flurry of a snow storm, the Huberts discover a ragged nine year old girl sheltering under the neighbouring cathedral porch. Childless and pious, the couple take in and raise Angelique as their own. The girl is intensely passionate, and given to rage and disobedience as well as love and religious fervour. Inspired by The Golden Legend, Angelique creates a dream world all of her own, peopled with spirits. As part of her dream vision, she becomes convinced shewill marry a rich and handsome young prince. Her wish seemingly comes true when she falls in love with a lord's son... 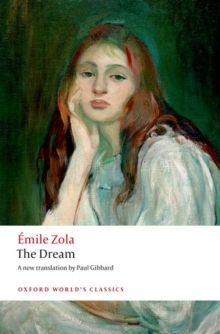 The sixteenth novel in the Rougon-Macquart series, The Dream marks a departure by Zola from the conventions of realism. Here, Zola explores the persistence of mysticism, but also blends elements of fairy tale with the naturalist techniques for which he had become known. This edition contains a wide-ranging introduction placing Zola's changing concerns in the context of his wider work, and illuminates key themes in the novel, such as architecture, heraldry, and the lives of thesaints.